If you are unable to get the yeast to activate in the milk, just activate it in a 1/4 cup of warm water, wait 5-10 minutes and then combine with the milk. Prep time includes inactive rise time for the dough. Plan ahead accordingly. In a small saucepan, heat 3/4 cup of the milk until warm to the touch but not hot (about 105°F to 115°F on an instant-read thermometer). Transfer the warm milk to a large bowl and sprinkle the yeast on top. Set aside for about 15 minutes to activate the yeast. Sift the flour, sugar and salt together into a large bowl; set aside. In a small saucepan, melt 7 tablespoons of the butter. Let the butter cool, then transfer to a mixing bowl. Using your stand mixer, add the eggs and orange zest and mix together. Then, add the yeast mixture until well combined. Add the flour mixture little by little into the yeast-egg mixture until well combined. Turn the dough onto a floured work surface and knead until smooth, flouring your hands and the surface as needed, for about 3 minutes. Coat a baking sheet and a 16-inch piece of plastic wrap with the remaining 1 tablespoon butter. Set the dough on the baking sheet and cover it with the plastic wrap, butter side down. Let rise in a warm place until doubled in size, for about 2 hours. Remove the plastic wrap and set it aside. Divide the dough into 3 equal pieces (about 12 ounces each). Roll the pieces into 1-1/4-by-16-1/2-inch ropes. Pinch all 3 pieces together on one end to secure, then braid the ropes and pinch the other end of the ropes together to secure the braid. Set the braided dough on the prepared baking sheet, cover with the buttered plastic wrap (butter side down), and let rise in a warm place until doubled in size, for about 1 hour. Meanwhile, heat the oven to 350°F and arrange a rack in the middle. In a small bowl, beat together the egg yolk and remaining 1 tablespoon milk. 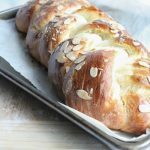 With a pastry brush, evenly brush the egg mixture over the risen dough, then sprinkle the almonds over top, pressing the almonds gently into the dough. Bake until the bread is browned and the internal temperature reaches 190°F on an instant-read thermometer, for about 30 minutes. Let cool before serving.